Even though summer is almost over, I feel like picnic season is still in full swing. In fact, with fall around the corner, the weather will be even more perfect to enjoy outdoor time with your loved ones without the oppressive heat and/or humidity that summer usually brings. 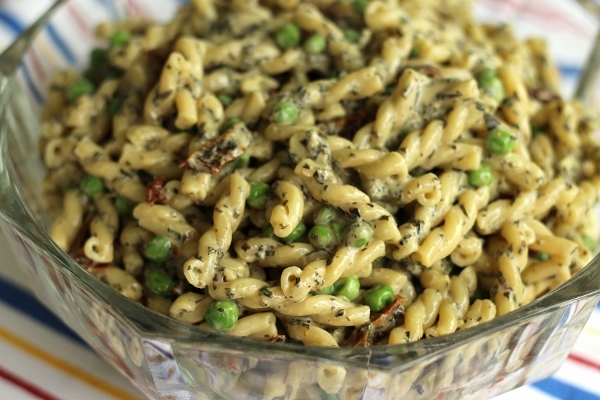 Pasta salad has a reputation for being pretty boring. A lot of times it's either drowned in mayonnaise or bottled Italian dressing (or maybe both). Either way, it needs a makeover. I started by using gemelli pasta, which is a short, chewy, twisted pasta shape. 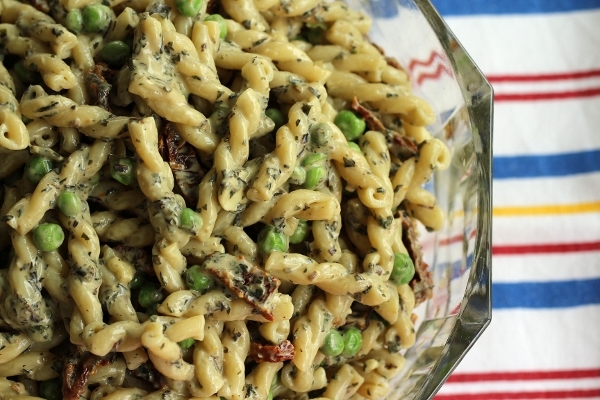 It's a bit less traditional, but it's a great choice for pasta salad! 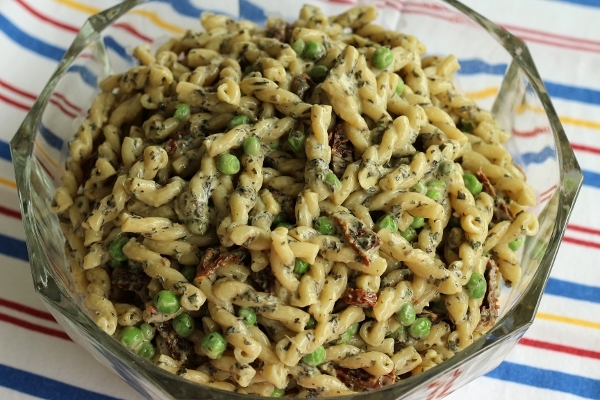 My pasta salad features homemade pesto utilizing Armenian basil (a more purple-and-green variety than traditional basil). I make tons of this nutless pesto (it's lower in fat and cheaper this way) and then freeze it (without cheese) in ice cube trays. Then I simply defrost, mix in some Parmesan and I'm ready to go. I used some of this pesto for my pasta salad, but you can use any homemade or store-bought pesto of your choice. I actually mixed equal parts pesto and light mayonnaise to make the dressing, with just a bit of lemon juice to brighten up the flavor. 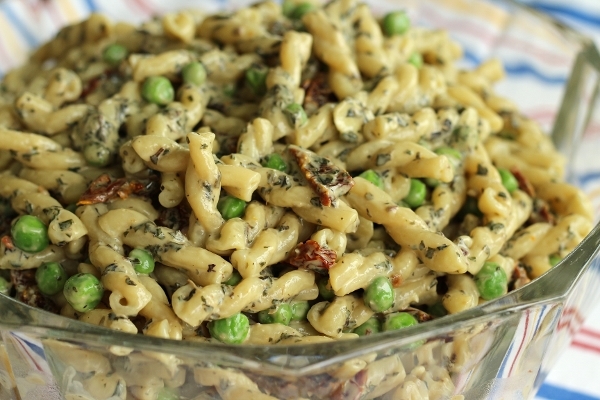 The mayonnaise makes the pasta salad glossy and creamy. The Parmesan flavor in the pesto really shines too. I do find that the pasta absorbs the dressing and is far less creamy if served the next day, so definitely eat this the day you make it, or just keep the dressing separate from the pasta and mix it the day you plan to enjoy it. 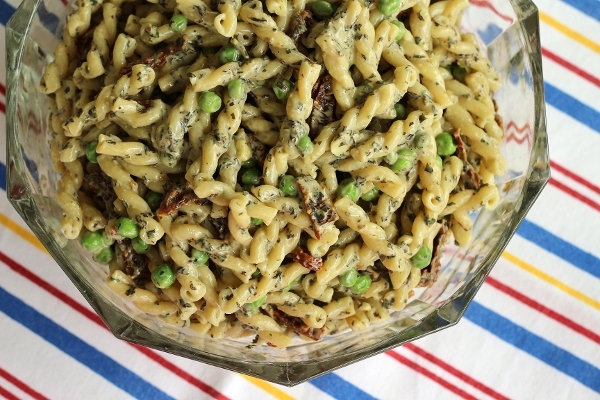 Sweet peas and sun-dried tomatoes are great additions to this less-traditional spin on pasta salad. Not only do they both add a burst of color, but they are a perfect pair flavor-wise. I will definitely make this pasta salad again and again. It is so simple to make with ingredients I already have (especially easy if you freeze pesto like I do!). To make the dressing, stir together the pesto, mayonnaise, and lemon juice. If your pesto is homemade, it should already be well-seasoned, but if not, adjust the seasoning as necessary. Set aside. Meanwhile, bring a pot of salted water to a boil. Add the pasta and cook until a minute shy of al dente. Add the peas and blanch them during the final minute of cooking, just until the peas are heated through, but still bright green. Drain the pasta and peas in a colander. Run cold water over the colander to shock the cooking process and cool the pasta and peas. 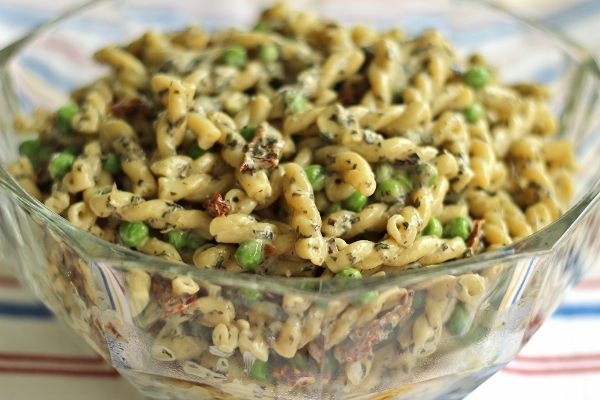 Add the drained pasta and peas to a large mixing bowl and add the dressing and sun-dried tomatoes. Mix until well combined. The pasta salad is best the day it is made, before it begins to absorb the dressing, although it's still tasty the next day.